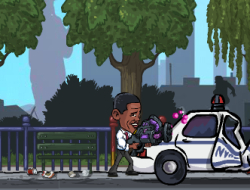 This is a tower defense game in which the president of the United States of America has to defend the white house and his whole country from the alien attack. They are coming in great numbers and your job is to make sure that you learn how and where to place the defense turrets in order to keep them from crossing the line. You will get money for each one of them that you kill. Manage them well and you will surely live to fight anther wave. Upgrade the turrets improve their offensive qualities. Obama Alien Defense 10.00 between 0 and 10 based on 1 votes.